Oh I love me some mac’n’cheese! 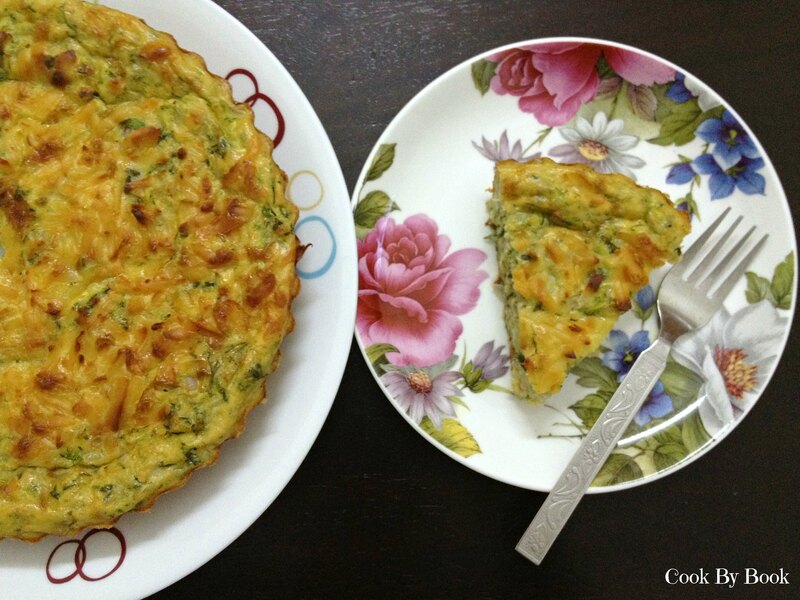 It is my no.1 comfort food… I love it on a rainy day, on a bad day, when I’m sad, when I’m happy! I crave for it. I resist few times and sometimes just cave in! 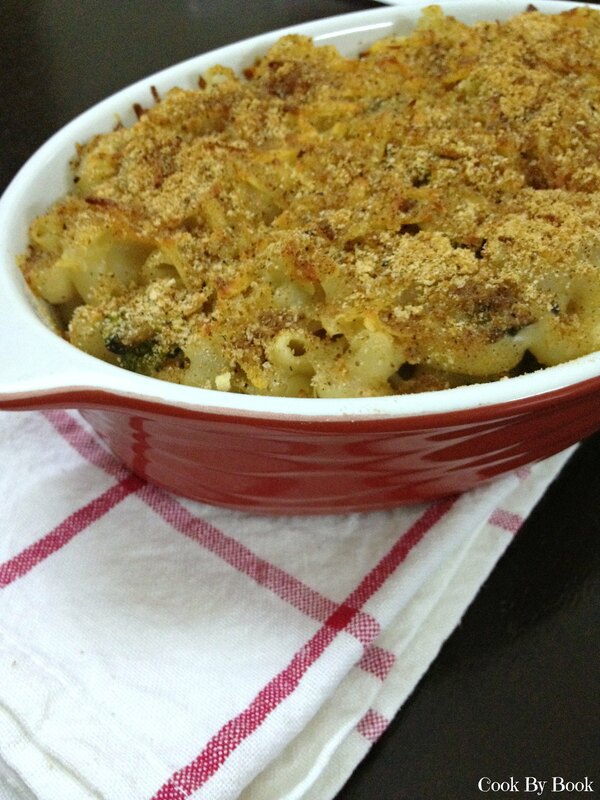 To be honest, I can’t allow myself good-old-over-the-top-cheesy mac’n’cheese everytime I want one! So I gave it a skinny make-over! Of course they are not totally guilt-free but everything in moderation doesn’t hurt right?! 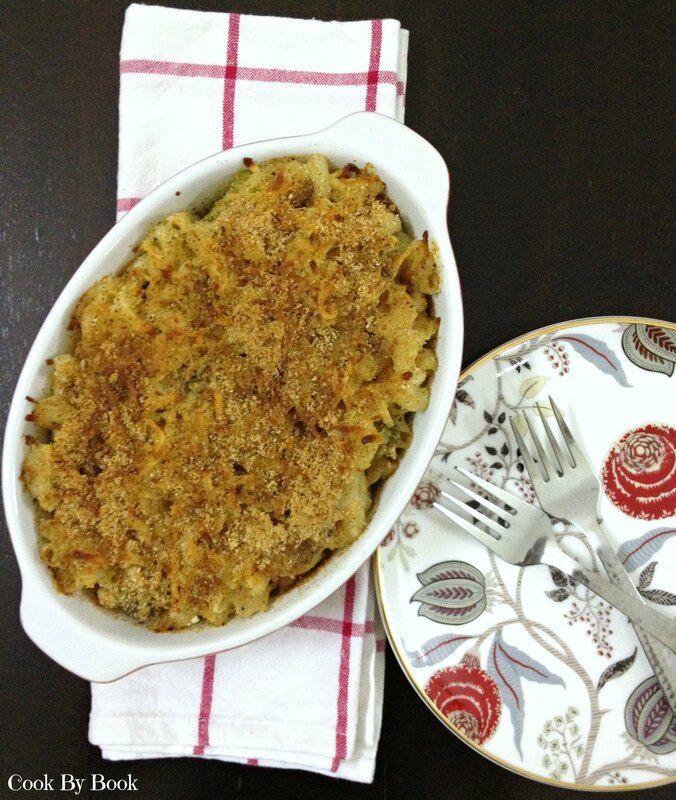 If you are anything like me then you are going to love my version of mac’n’cheese. It has goodness of vegetables too. 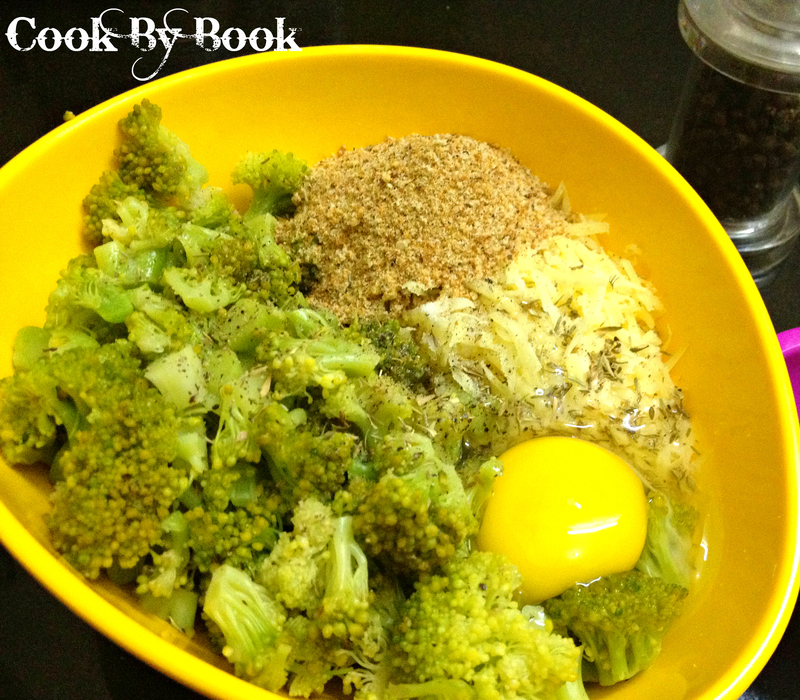 Yup, I have added some veggie tid-bits to make it little bit nutritious and kid-friendly. Best for those picky-eaters! You can sneak in any vegetable you want. So wait no more & make it tonight! Cook pasta and broccoli together in a large pot of salted water as per the package instructions for al dante (or slightly under-cook for 2 minutes). Keep 1 cup of pasta water aside if you do not have vegetable stock. 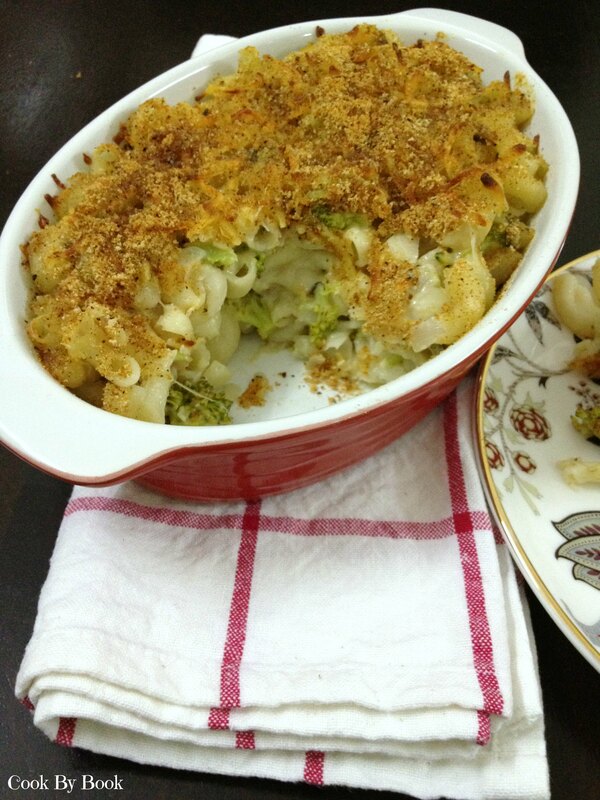 Drain cooked macaroni-broccoli in a colander. Grease a baking dish with oil and preheat oven to 190°C/375°F. In a large pan, melt the butter over low heat. Add onion and saute it for about 2 minutes. Then add and saute mushrooms, chili flakes for another 2 minutes. Add flour and saute for another minute till flour is golden and well-combined. Add milk and vegetable stock/pasta water and whisk raising heat to medium-high. Let it boil for about 3-4 minutes or till the sauce becomes smooth and thick. Once the sauce is thick, remove from the heat. Season with salt and pepper. Add grated Cheddar and mix well until cheese is melted. Adjust seasoning. Add macaroni and broccoli and mix well. In a prepared baking dish, pour the mix. Top with grated cheese. Combine breadcrumbs, garlic powder, pepper together and sprinkle over the cheese layer. Spray a little more cooking oil on top. Bake for 15 minutes and broil for 1-2 minutes for golden breadcrumbs. 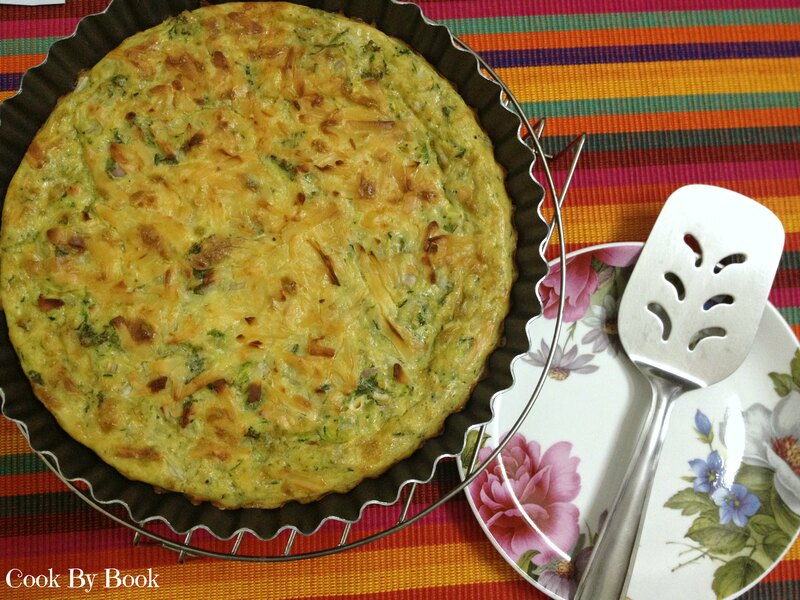 A wonderful savory pie made with zucchini, parsley, basil, onions, Cheddar and Parmesan cheese. 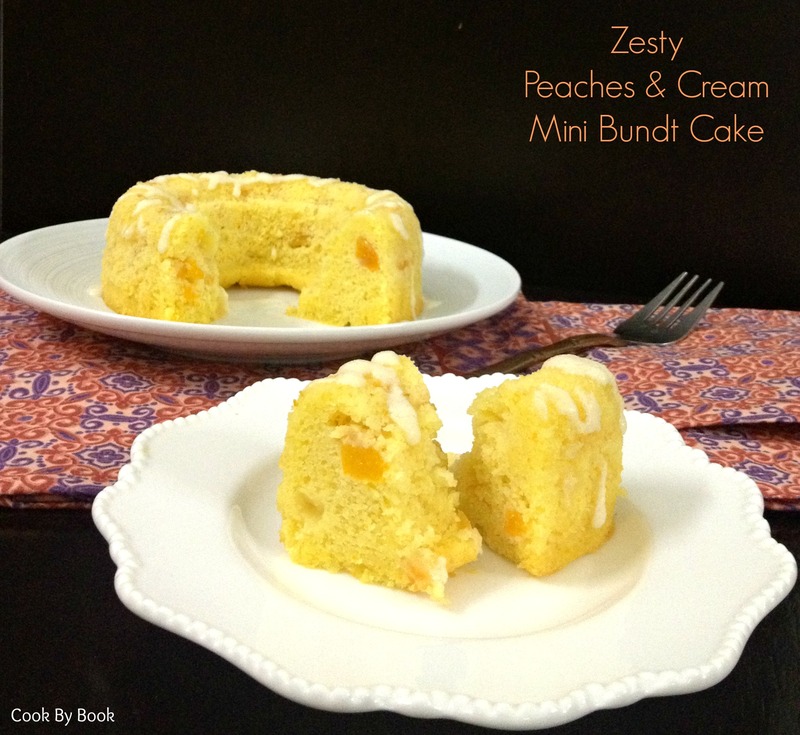 A simple recipe to make your meal exciting! 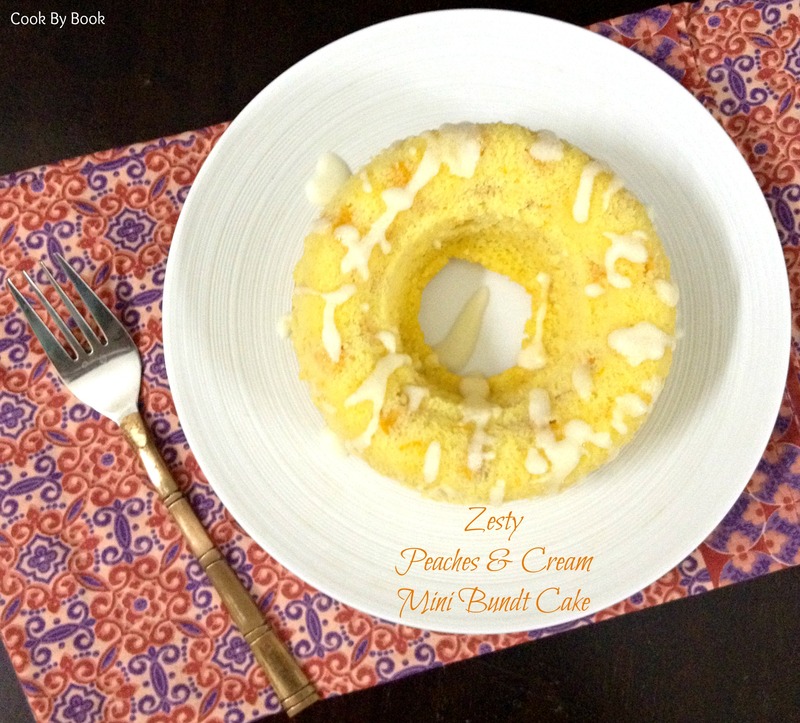 It is as easy as all the other recipes on my blog as easy is what we all love, isn’t it? The hero of this pie is my favorite zucchini which is available in abundance around this time of year. The flavors get a touch of refresh due to parsley and basil leaves. 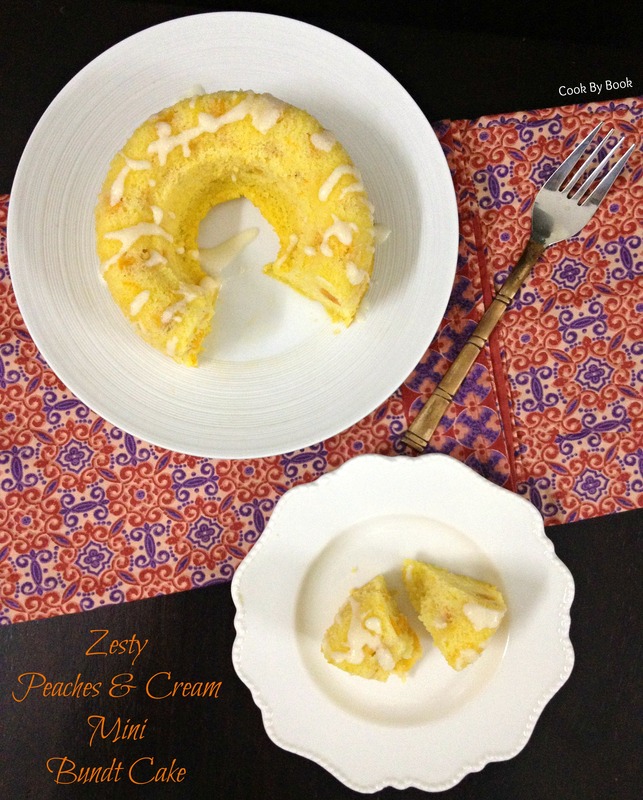 It is perfectly cheesy and oh-so soft and moist. Be sure to squeeze all the liquid from grated zucchini otherwise the pie will stay uncooked at places and it will be sticky while slicing into pieces. So squeeze it down till its last drop, okay?! Shred zucchini, put it in a cheese cloth or muslin cloth and give it a good squeeze to remove extra liquid. Preheat the oven to 400°F/ 200°C. Grease a pie dish with olive oil. Combine zucchini, onions, parsley, basil and cheddar cheese in a bowl. Sift flour and baking powder in a medium bowl. Add milk, olive oil, beaten eggs, salt and pepper to it and blend well. 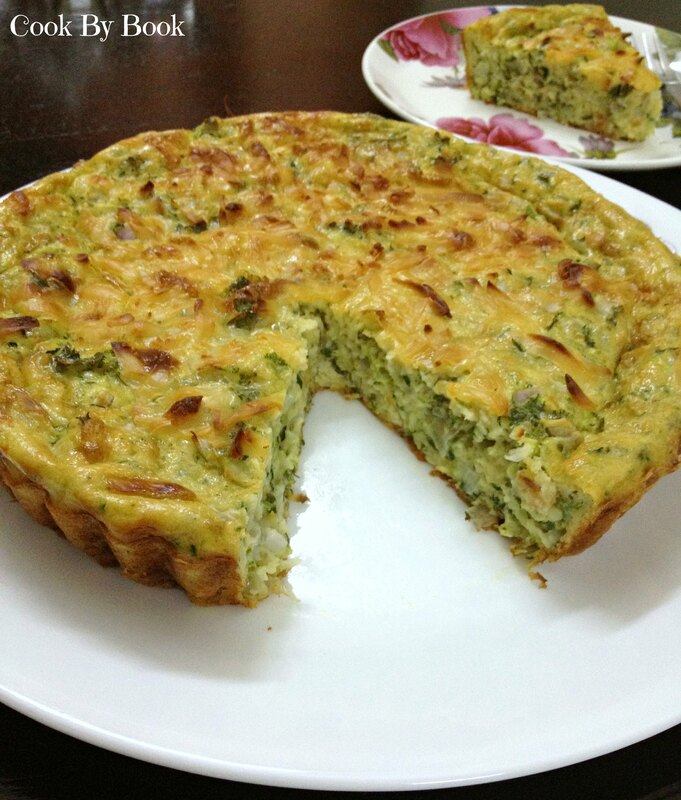 Combine with zucchini mixture and pour it into pie dish. Top with Parmesan cheese and bake for about 35 to 40 minutes or until toothpick inserted in the center comes out clean. Mine took exactly 37 minutes. Let it cool on a rack for at least 5 minutes before serving. *Serve it with crème fraiche or fresh tomato salsa. Pairs well with soups too! I hope you all had an awesome weekend. I personally had a very enjoyable Sunday (I have a working Saturday 😦 ). But on Sunday, my hubby’s few friends and us got together for a brunch and played Pool, Dumb Charades etc. and it was whole lotta fun!!! And then my Monday Blues started (can u blame a girl???). So coming to last weekend, I was too tired after work on Saturday to cook anything elaborate for dinner and too finicky to eat out or order in! Plus there was a broccoli head staring at me in fridge from last week and I hate wasting/throwing any form of food. 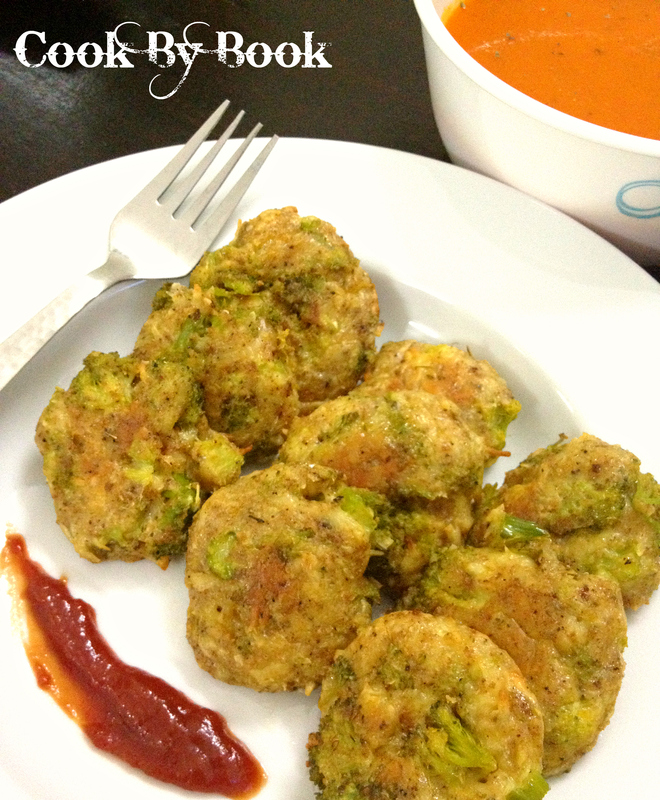 Hence I thought of making this eezee-peezee appetizer and decided to serve it over Tomato & Red Pepper Soup. It turned out to be an amazing combo! Posting my recipe for Tomato & Red Pepper Soup is a tale for another time (I know you can’t wait but plzz wait!!!). 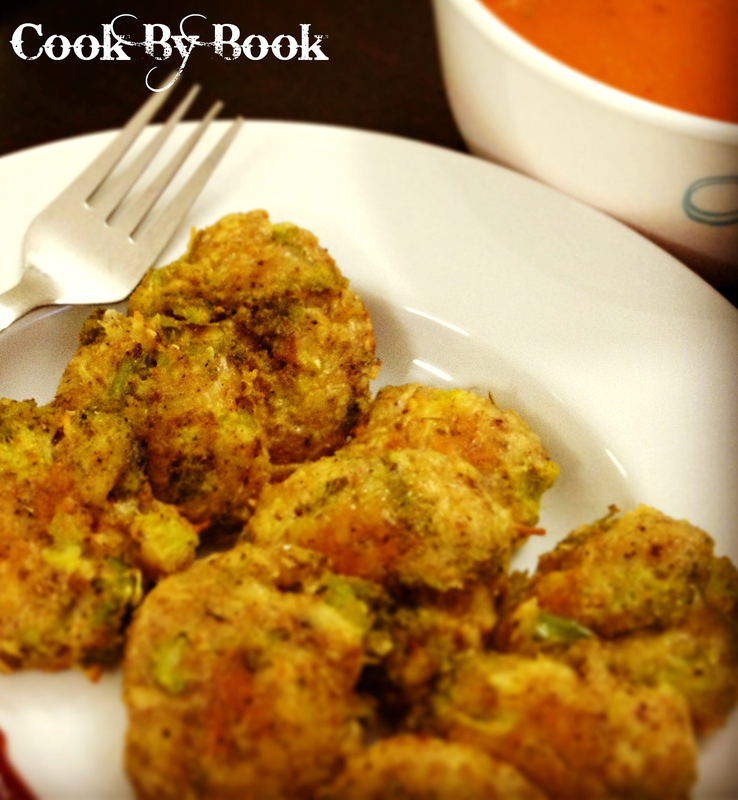 So here comes the recipe of yummilicious Cheesy Broccoli Bites! Cut broccoli into big florets. Let it steam for 2 minutes and then chop it finely. 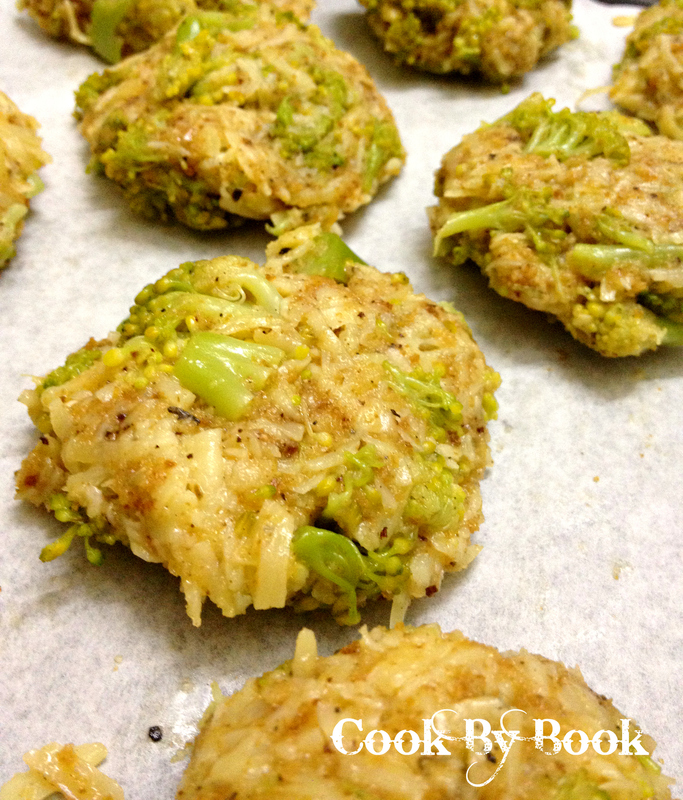 Form small patties with your hands and lay on a greased parchment lined baking sheet. Bake at 375F/190C for 30 minutes, turning the patties after the first 15 minutes.